Your Time is Precious - Reduce long decanting times from hours to seconds with iSommelier's revolutionary molecular air filtration system. Upgrade to iSommelier Pro – Control the iSommelier Pro directly from your smartphone. WiFi enabled. ★★★★★"iSommelier does what it says it can do. I decanted a complex Cabernet Sauvignon in 3 minutes and it tasted better then if I had waited an hour" - Brandon G.
iSommelier is the solution to eliminate all limitations during conventional decanting. and aromas of the wine in just a few minutes. modern life. Enabling you to decant in minutes not hours. iSommelier filters the ambient air to remove any impurities (moisture, dust, odors) and isolates oxygen from nitrogen and carbon dioxide. It aerates wine with a constant flow of purified and highly concentrated oxygen thanks to its advanced oxygen extraction system which uses no chemicals. Purified and highly concentrated oxygen flows upwards into the specially designed tube inside our patented decanter. It then reverses direction, and flows downwards and back out into every milliliter of the wine. buttons to start, pause and stop the control of your decanting progress. In regards to Pro vs 'Standard' - Is the wifi/smart phone app the only difference? The 'Standard' still has all the same sets of controls that we on the unit itself surrounding the carafe? BEST ANSWER: The iSommelier Smart Decanter and the iSommelier Pro have all the same features except you can control the iSommelier Pro with your smartphone and it's WiFi enabled. Does this come with the 750 mL carafe or the 200 mL? And can you decant just half a bottle at a time in the 750 mL carafe? BEST ANSWER: The iSommelier Smart Decanter comes with the 750ml carafe and you can purchase extra 750 ml carafes if needed. You can decant whatever amount you want to - a full bottle, a half bottle, or a glass of wine. Only the 750. The 200 mL one can be used provided you can find a place from which to purchase. There are clear markings on the carafe starting at 150mL and incrementing each 50mL. I do 1 glass all the time. It makes such a difference in the wine....yummy. 750 ml. You can decant as much as you want. Does this have a database of wines to know the decant time for different wines? BEST ANSWER: The iSommelier Smart Decanter can assist you with decanting times. You will need to download the iFavine app to gain access to decanting times plus much more about wines, wineries and wine pairings. I have tried to search my Winery on the app and it does not list it. Can you help? The system comes up with a recommendation based on country, region, grape, age and alcohol content. I suspect it is just a math model and not a data base. But it works. No. All that you can choose is year, varietal and alcohol content. BEST ANSWER: The iSommelier Smart Decanter is 9 1/2 inches wide, 14 inches long and 9 1/2 inches high. Can you use any existing decanter with this unit ? BEST ANSWER: No. The filtered air is introduced to the wine through a central tube in the iSommelier decanted. Normal decanters lack such a tube. Take close look at pictures of the iSommelier decanter, and I think that you will see what I mean. The decanter has an opening on the bottom that goes to an internal glass tube and seal that it uses to bubble pure oxygen in to the wine. So the unit must use the included decanter only. No you can not. This decanter has a special tube (viewable in the product picture) to allow oxygen to decant the wine in the decanter through the bottom o f the decanter. No. You must use the decanter that is specially made for this unit. It has a central cylinder that the aeration goes through. No. It requires a special decanter, which you can purchase separately. No, you need the decanter that comes with the unit. Based on the design drawing, i am wondering if any wine drips down the center tube after pouring? BEST ANSWER: We have used the decanter at least 20 times and have not experienced any wine dripping down the center tube. Now we decant every red wine due to the ease of use and time saved benefits. Cheers! The iSommelier Smart Decanter is a terrific product and we have not heard of any issues with wine dripping down the center tube. After regular use for 6 weeks I have never had this occur nor do I think it's a concern. The center tube is sealed at the top. It does not-it is a perfect pour. BEST ANSWER: Just rinse with hot water. No soap. It will affect the taste of the wine. Turn upside down afterwards. The iSommelier Smart Decanter directions for cleaning and care are as follows: It should be unplugged prior to cleaning. Do not use harsh abrasives when cleaning the unit, just wipe down the surfaces. The air filter may need cleaning every 6 months or so, depending on use and the decanter should be rinsed out with hot water and air dried. The instruction manual recommends rinsing the decanter with hot water after use and air drying. The unit itself can be wiped with a damp cloth. Do not use soap. I use hot water and rinse thoroughly as well as use a cleaning brush. What spirits would it help taste better ? BEST ANSWER: The iSommelier Smart Decanter works best with spirits which have undergone oak aging; such as whiskey or rum. The iSommelier Smart Decanter will enhance the aromas and the taste of the spirit you want to decant in a matter of seconds. We only use it for wine, particularly reds. Bought as a Christmas present for my husband. Loved what it did for our wine. Only concern is the condensation in the inner tube after cleaning. It didn’t dry after at least 12 hours on a drain board. Anyone have a fix for this? BEST ANSWER: Here's what I do: I insert a Wine Enthusiast Wine Decanter Dryer into the decanter. You have to do this carefully because it's a tight fit with the tube in the middle. Gently work the beads in the dryer to get it inserted. I then cut a square of Black Course Uni Filter 30-PPI and set this on a surface, then put a paper towel folded twice on top of that, and set the decanter (with the dryer inserted) on top of the paper towel + foam. I have this setting in front of a fan that I always have on. Within 12-24 hours, the inner tube should be completely dry. You can get the black course foam on Amazon. I rinse mine thoroughly with hot water after using. Then I place it upside down in a rack made specially for drying decanters. This lets everything air dry, Hope that idea helps. how do you clean decanter? BEST ANSWER: For routine cleaning, I rinse thoroughly with hot water. Don't use soap as this could give your wine an off taste. Once in awhile, I add a few drops of Wine Enthusiast Stem Shine as part of the hot water rinse. Dennis, there are a few options for easy cleaning, you could rinse thoroughly after use with hot water. Also we recommend using Decanter Cleaning Beads as well. Do the filters, first stage or the oxygen one, ever need to be changed or cleaned? BEST ANSWER: Other than the foam dust filter, there are no other filters that need to be changed or cleaned. It's just a foam dust filter, it can be easily removed and cleaned under running water. Where can we see this demonstrated? 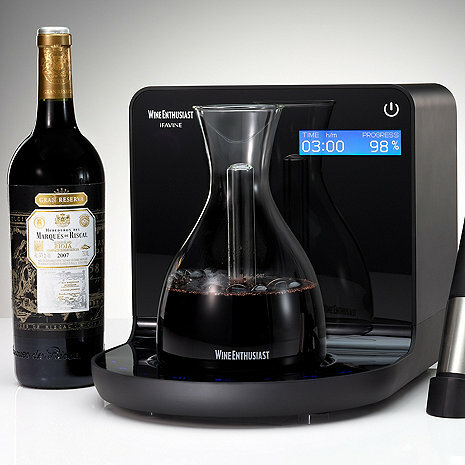 BEST ANSWER: The ISommelier Smart Decanter is the solution to eliminate all limitations during conventional decanting. We do have a video on the item page and a detailed product manual to give you more information about the decanter. There are two helpful videos on the page. My iSommelier decanter has this white crusting on the inside of the tube that my husband and I cannot seem the clean off... any suggestions? if in doubt, is there a "safe" period of time to decant a specific wine? BEST ANSWER: The iSommelier Smart Decanter is designed to work most effectively with the iFavine app to determine the best decanting time for your wine. There is no "safe" period but you can start by decanting your wine on the iSommelier for 30 seconds - 30 minutes in real time - and then taste your wine. You can try the 30 seconds decant until the wine tastes to your liking. NEWEST WINE DISPENCER, what is? BEST ANSWER: The iSommelier Smart Decanter is a wine decanting system that only takes a minute to decant your wine that would normally take an hour to decant. It uses revolutionary technology that reinvents the decanting experience to enhance the flavors of your wines or spirits. 1.What do you do if the wine has sediment? 2. Can you pour the aerated wine into another decorative decanter for serving if you are having a dinner party, etc? BEST ANSWER: The iSommelier Smart Decanter is a fantastic way of decanting your wine in a matter of just a minute or two. My suggestion on removing sediment prior to using the iSommelier is to use a funnel when pouring the wine into the decanter and yes, you can absolutely transfer the aerated wine into a more decorative decanter for serving at the dinner table. At my age with more and more wrinkles and a hairline rapidly racing towards my rear end, wine is my one remaining vice. Wine is also my hobby. Decanting wine has often been a problem for my wife and I in that We don’t always effectively plan our meals or meal times. Often there is not always an ideal amount of time to aerate/decant a bottle before the meal is ready. I have tried several products over the years, but most of these were a disappointment. Alas, I have become a bit cynical, a bit cautious, and in retirement, a bit more cautious with a Peso. But still, I had to give this a try. EVERYBODY concluded the first bottle was unacceptable while the second bottle was very drinkable…much improved! I have not used this for an expensive bottle yet, but with the first test results being as noted…I believe this tool is absolutely a keeper! Expensive but the device does a remarkable job smoothing out some of the rough edges on reds. Instruction manuel is borderline useless and did not have any information on how to obtain the app. Side by side taste comparisons show that the product really does work and provides huge time saver with the ability to serve the wine at proper temp after only 1 to 2 minutes of decanting. We had a get together with some friends the other night and used the smart decanter. It was so easy to use and the wine truly tasted better. One warning is that be sure not to over decant the wine. You should start with one minute and work your way up - keep tasting until it reaches perfection. We are happy with this purchase and would highly recommend it. An incredible machine. It will take a bottle that needs to be aired for an hour and air it in 45 seconds. Its easy to see that this product really works, since you can pour half a bottle in the decanter and aerate it, and compare it with the other half left in the bottle. You will clearly notice the difference. Just be carful not to get excited and over do it. Drink what you want when you want! Simply gets good wine that needs air to a good place quickly. Now we can open up a great young bottle last minute instead of decanting for hours. The perfect size for a healthy pour and easier to clean than the standard carafe. Very happy with this product, as it makes decanting easy and much faster. Best decanter on the market! This SS is the best thing the wine industry could have. I actually take it to parties or dinners with friends. Everyone thinks I'm nuts until they drink the wine and see the difference. Every restaurant that serves fine wine or not should have one for their clients. It really works! All wines need to be decanted and allowed to breathe . I'm surprised how many of my friends think you should only decant those wines that have sediment .The problem is that you don't know how long it will take a wine to open up . With this device , you can in minutes , not in hours , go in stages to find the ideal decanting time . Before I got this , I poured out a lot of wines that hadn't opened up in an hour because I didn't want to wait any longer . No more . After testing it on 2-3 initial bottles over the weekend, this product makes a significant difference. My wife and some friends tested it and compared tastes from newly opened bottles versus iSommelier decanted bottles. The iSommelier made the red blends and Cabernet Sauvignons we tested much smoother to drink and provided much greater depth of flavor. We were impressed and look forward to further testing. However, the iOS app is atrocious. I simply do not see the value in paying over 50% more for Wi-Fi capability in the Pro Model. That pricing is ridiculous. I nonetheless tried using the app to find recommended decanting times for specific bottles. The database seems to be very, very small and limited. Even when I look up existing bottles in their known database, when I try to view suggesting decanting times, I get a message that the unit it not paired. My understanding is that my non pro unit has no wi-fi capability and cannot be paired. The Smart Decanter really works&however, because the APP that is used with the Pro is in its infantile stage all the operations do not work as well as they should to make the Pro worth the extra money. Maybe in another year or so they might have it working at its full potential. My main gripe is with WE having to spend 50.00 to send it back to them, They want to make sure youre happy with their products but on your dime&I give them a 1 star for returns! Want to love this device, but the APP that is required is brutal. First of all, there is no mention of the name of the App in the instruction manual. The only thing I found were two iFavine apps (which never finished downloading but I was still somehow able to open. Deleted and tried again with no different results), but it does not look at all like the videos, and the only decanting times it will give me for a California Cab is either 0 minutes, or as I change the vintage to see if it will ever say anything else, it will say be careful with decanting older wines. Which means I have to guess, which, for me, defeats the whole damn purpose of this thing. It also comes with what appears to be extra filters and stickers, but no mention of either, anywhere. I WOULD NOT BUY THIS AGAIN. I would also never even attempt to suggest this to anyone even remotely unsure around technology. Love it! We have noticed a distinctive difference with our reds. Glad we made the purchase. Absolutely would recommend this item to any and all red wine enthusiasts! We have a wine cellar with many older bottles and hoped that the smart decanter would help us drink them without the 'planning' necessary to sufficiently aerate the wine. The decanter has made a noticeable improvement to all the red wines we have used it on, even ones over 20 years old. We would highly recommend this product. So easy and definitely worth every penny. Love it! The iSommelier performs exactly as described. I have been delighted with its performance with your tannic wines. I had 9 year-old petite syrah that I feared would never be drinkable, but after "6 hours" in the iSomm it was smooth as silk. A little expensive, but performs admirably, it is true you get the true benefits out of any wine when using the iSommelier. Love this decanter! Works amazingly well and love the flexibility to chose a wine right before dinner and not have to wait! Both recipients were thrilled with it and with the results as well. Did a few comparisons with hand held aerators and liked the ‘machine ‘ taste better. This product is great. My husband uses it regularly and it has been a great addition to assist in our enjoyment of wine. We highly recommend.